Airports are at the forefront of global business technology innovation. Fast moving technology trends are disrupting the status quo and transforming airport operations, services and economics. Industry research predicts that airports that embrace these strategic technology trends will be positioned to exploit the changing airport business environment over the next 5 years. The term “Smart Airport” is being used by business analysts to define the progressive airports of the future. 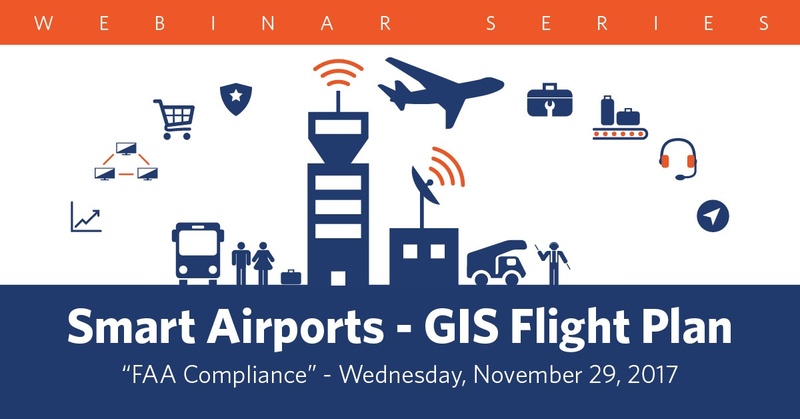 Esri and GISinc are co-hosting this six-part webinar series to provide insights and examples of how GIS and related GeoIoT location-based technologies will help to deliver innovative Smart Airport capabilities and solutions. Each webinar will explore topics relevant to Airport Technology, Marketing, Operations, Security and Finance Executives, Airport Operations and Maintenance Managers as well as GIS Managers and staff.